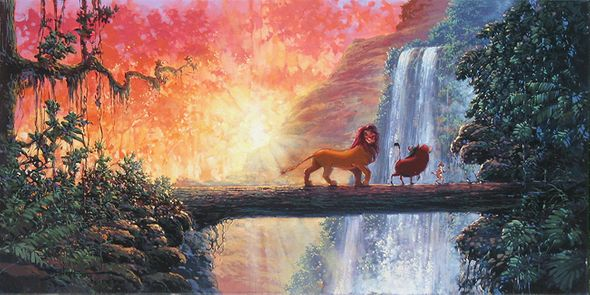 Rodel Gonzalez Signed and Numbered Limited Edition Hand-Embellished Giclée on Canvas:"Hakuna Matata"
Size: 15" x 30 "
From the Artist: "Having the opportunity to create Disney paintings is such a treat because Disney was definitely part of my childhood. I remember watching my first Disney films "Bambi" and "Snow White" and ever since I've been mesmerized by the succeeding Disney movies I've seen. I believe a painting is a mirror of the painter's understanding of an insight he has. The Disney paintings each involved such a strong concept that every brushstroke was a joyful anticipation of the finished product. The energy was very strong therefore my intentions were sure and refined. I would say that there was a lot of grace present on every painting.